Everyone knows if in Minecraft PC click on «F5", change the angle, first at the camera from behind, then the front. Mojang also added such a possibility, but not until the end. You can not shoot yourself from the front. Not fair, is it? After all, the mobile version of this great game is becoming every day more and more popular and the number of players around the world is growing at an unprecedented rate. And the ability to shoot himself in front just need to make a beautiful intro or dubbing. This mod is exactly what was missing. Typing «/ f5", you can change the camera angle or zoom out the camera just a little further. Play as possible, but for a good letspleya is necessary. In order to return everything to the place you need only enter a slightly different command «/ f5f5", then everything will be as before. 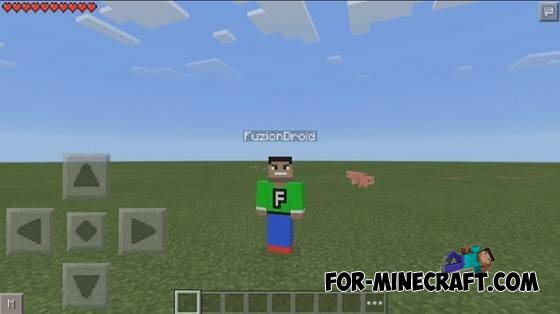 How do u activate it on mcpe?? Please don't day block launcher cuz that don't work for me.